Given that any breed of rabbit can make a great pet, there are two factors to take into consideration before choosing a rabbit. First: the size of the rabbit and secondly: the amount of care it requires. Large rabbits may be affectionate, laid back pets but they do require large cages, more room to exercise and more food. Very large breeds may be difficult to handle and prone to problems. Wool breeds require daily grooming. Some small breeds don’t do as well with young children as some of the slightly larger and hardier breeds like Dutch and Mini Lop. Another thing to consider is age. It is probably best for a first time rabbit owner to adopt a mature rabbit between one and three years old. Which has already been spayed or neutered. Older rabbit is easier to house train and less destructive. 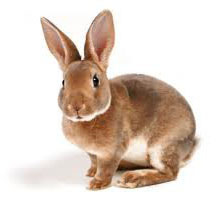 Some of the most low maintence rabbit breeds which weighing no more than 6 1/2 pounds fully grown are : Mini Rex, Holland Lop, Dutch, Dwarf Hotot, Mini Lop, Mini Satin, Netherland Dwarf, and Polish. Ckeck out our FAQ section for more information. Click Here.